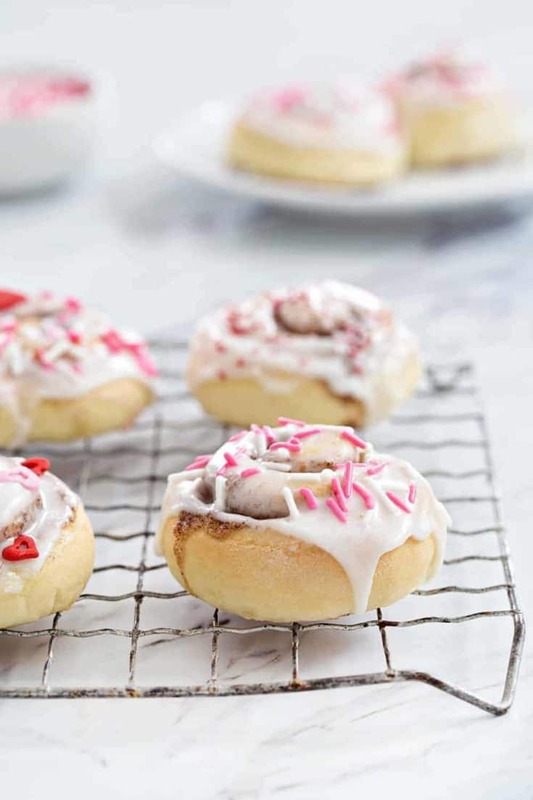 Mini Cinnamon Rolls are a fun and delicious way to celebrate any holiday! A sweet glaze and colorful sprinkles make them extra festive. Let’s chat Valentine’s Day, shall we? You guys, I have to be real with you. I’m just not that into it. But before you start thinking I’m some kind of cupid crusher, let me explain. I’ve never really been into Valentine’s Day, whether I had a significant other, or not. And let’s not even get me started on Sweetest Day. If you have no idea what Sweetest Day is, that’s because it’s pretty much only celebrated in the Midwest and Northeast. It’s basically Valentine’s Day 2.0 around these parts. Yep, it’s totally a thing. I’m pretty low maintenance when it comes to romance. Other things not so much. I could spend an eternity blending my eyeshadow and filling in my brows, but that’s neither here nor there. But when it comes to romance, I’m all like tell me I’m pretty, empty the dishwasher, and pick up my Indian take-out. Oh, and send me flowers every once in a while, BUT not on a holiday. Okay, this is kind of making me sound high maintenance, but I swear I’m not. I’ve just never been into holidays that are meant to celebrate love, like shouldn’t we be doing that every day? Or at least on days that I’m not annoyed that my husband left his late-night cereal bowl on the counter (with milk still in it) and little fruity o’s on the floor that I inevitably crush with the soles of my slippers. There’s a reason why I vacuum so much, AND it’s not the cats. Just sayin’. I mean, isn’t that what love is all about though? Embracing these little annoyances and celebrating the totally messy, sometimes ultra-annoying, imperfect perfect? Again, I’m not all anti-Valentine’s Day, but doing little things all year, even the simplest of things, like emptying the canister on the stick vacuum, or straightening my desk (hello, disaster) means a heck of a lot more to me than a dozen roses and a steak dinner on the 14th of February. Okay, okay. I won’t turn down a steak dinner, because there’s always creme brûlée at the end. Even though Valentine’s Day isn’t my favorite, Eric and I do make it special for Elle, just like my mom made it for me. With cute balloons, her favorite sweets and typically a totally adorable breakfast. 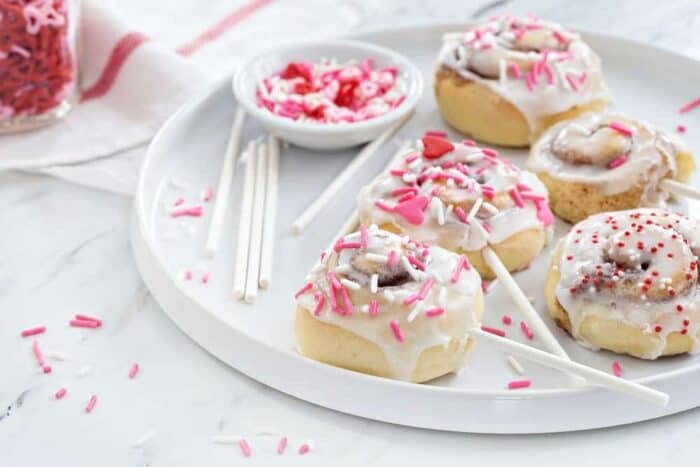 Last year I whipped up heart shaped, pink chocolate chip pancakes, but this year, I’m going with these Mini Cinnamon Rolls. 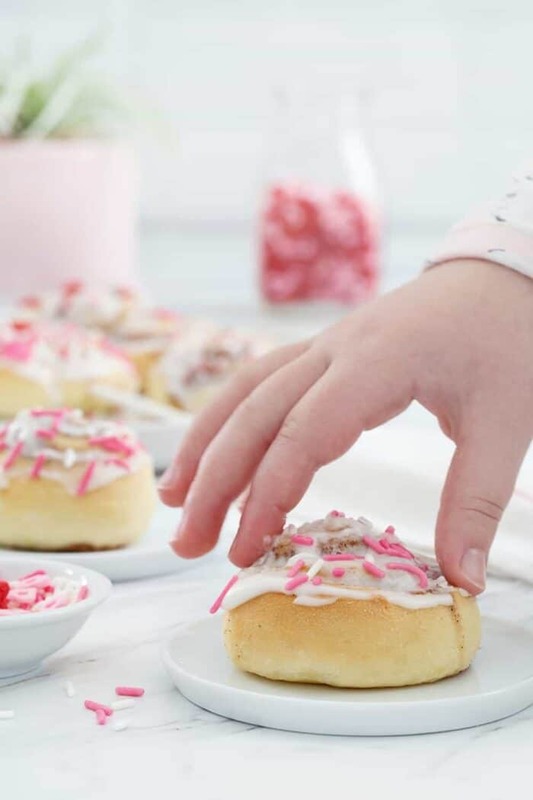 As if they aren’t cute enough on their own, I fancied them up with sweet pink glaze and festive sprinkles. And I put them on little sticks, because let’s be real, who doesn’t love food on sticks? Especially when that food is mini cinnamon rolls. So fun! If you’re intimidated by homemade cinnamon rolls, please don’t be. I receive so many emails from beginner bakers that are legitimately scared of working with yeast. I promise, nothing bad is going to happen, just be patient, follow the recipe, and use quality products like Fleischmann’s® Yeast. 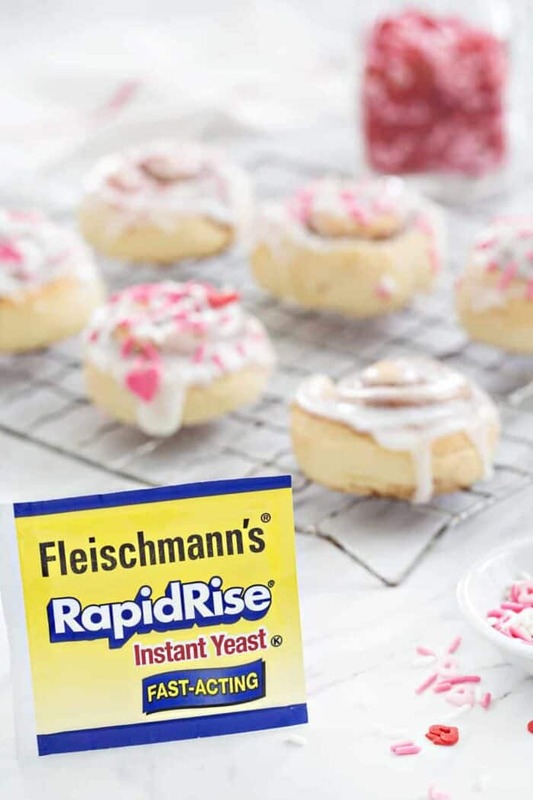 I’ve worked with Fleischmann’s® for years because in my opinion, it’s the best and most reliable yeast on the market. 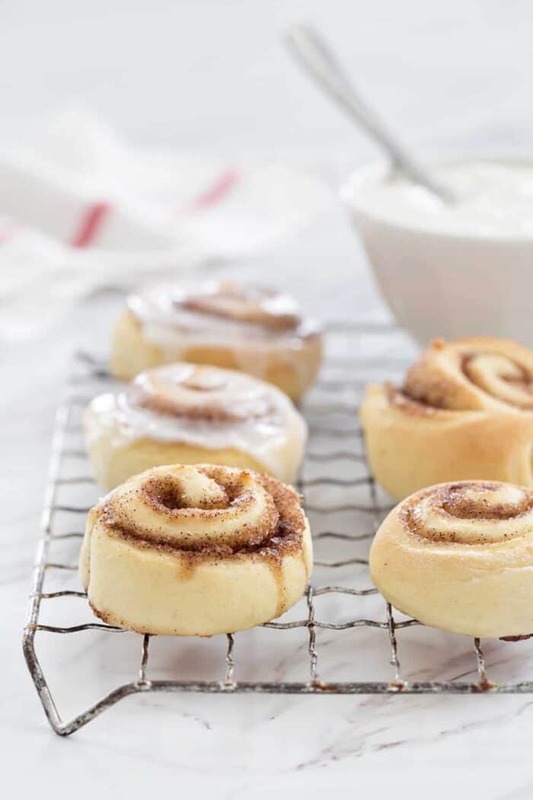 Whether I’m whipping up Overnight Chai Spice Sweet Rolls, Garlic and Herb Beer Bread Rolls, or Cinnamon Sugar Soft Pretzels, Fleischmann’s® Yeast gives me consistent results every single time. 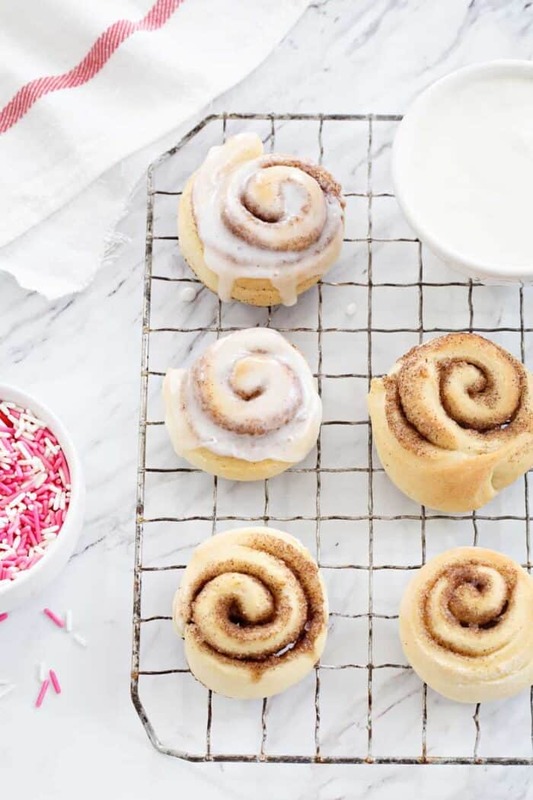 If you follow those tips, you’re golden and these Mini Cinnamon Rolls are going to become your new favorite treat for breakfast, brunch, and dessert! 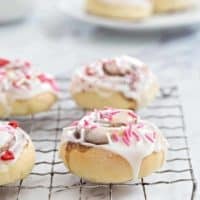 You can even whip these up in advance, and stick them into the freezer for baking at a later date. They’d be an amazing start to your St. Patrick’s Day or Easter morning too. Happy Valentine’s Day, my friends. I hope you know how much I love ya! Optional toppings, sprinkles, candies, nuts, etc. Bake in preheated 350ºF oven for 15 to 18 minutes or until rolls are golden brown. Cool on wire rack for at least 10 minutes. Insert lollipop sticks. Combine all vanilla icing ingredients in a large shallow bowl and beat until creamy. Icing will be thin. 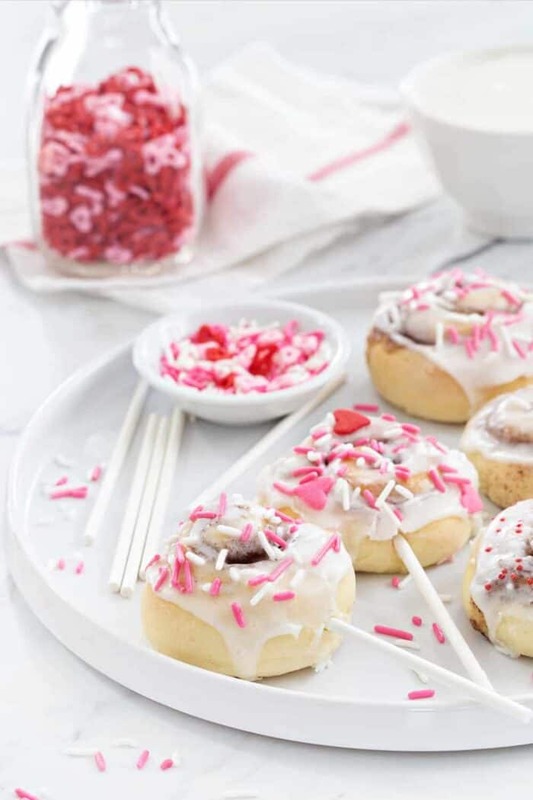 Let guests "dip" the tops of their rolls into the icing OR drizzle icing over all. If desired, serve with various toppings for sprinkling over rolls. Can I just let my mixing bowl do the kneading for me? If so, would it still be for 6-8 minutes? You sure can! I’d let it go in the mixer for about 1 – 1 1/2 minutes on speed 2. I hope this helps! Cinnamon rolls are my favorites! These mini ones just make it look cute, but equaly delicious, I’m sure. Thanks for the recipe!